Two groups of medals to a father and son consisting of: Queens South Africa Medal with Transvaal, SA 1901 and SA 1902 Bar, named 2435 PTE G.Wilmot RLY PNR REGT. 1914-15 Star named PTE G.Wilmot Piet Retief Commando. British War Medal named PTE G.Wilmot BOTHAS NTL HSE. Victory Medal named PTE G.WILMOT BOTHAS NTL HSE. 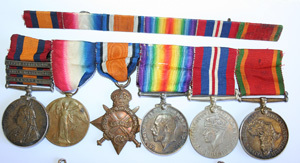 War Medal and Africa Service Medal both named 703833 G.WILMOT. Mounted as worn. 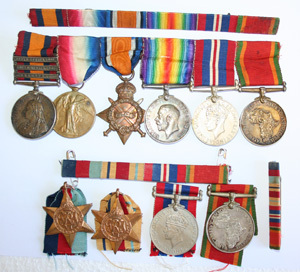 The second group consists of 1939-45 Star, Africa Star, War Medal and Africa Service Medal all named 135066 G.WILMOT. Include also are both original medal ribbon bars as well as a miniature ribbon bar for the son.